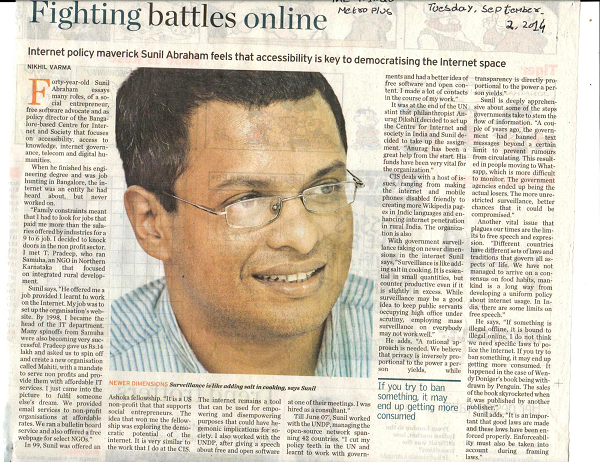 Internet policy maverick Sunil Abraham feels that accessibility is key to democratising the Internet space. The article by Nikhil Varma was published in the Hindu on September 2, 2014. Forty-year-old Sunil Abraham essays many roles, of a social entrepreneur, free software advocate and as policy director of the Bangalore-based Centre for Internet and Society that focuses on accessibility, access to knowledge, internet governance, telecom and digital humanities. When he finished his engineering degree and was job hunting in Bangalore, the internet was an entity he had heard about, but never worked on. “Family constraints meant that I had to look for jobs that paid me more than the salaries offered by industries for a 9 to 6 job. I decided to knock doors in the non profit sector. I met T. Pradeep, who ran Samuha, an NGO in Northern Karnataka that focused on integrated rural development.